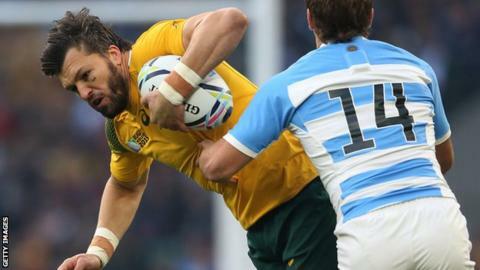 Australia must produce "something special" to be able to compete with New Zealand in the 2015 Rugby World Cup final, says coach Michael Cheika. The Wallabies won 29-15 against semi-final opponents Argentina to set up a meeting with the defending champions at Twickenham on Saturday. "They are the world's number one and we have only beaten them once in the last 10 matches," said Cheika. "So they will be feeling they have got our measure." New Zealand, who are aiming to become the first nation to retain the Webb Ellis Cup, reached the final by beating South Africa on Saturday. Cheika, 48, added: "It's going to be up to us to do something special, something extra just to be competitive." Argentina coach Daniel Hourcade refused to blame referee Wayne Barnes's decision to sin-bin second-rower Tomas Lavanini for their failure to reach a maiden World Cup final. Australia led 14-6 when Lavanini was shown a 25th-minute yellow card for a low tackle on Israel Folau. Englishman Barnes consulted his television match official and watched several replays before Lavanini was ordered off for 10 minutes. The decision prompted boos from many in the Twickenham crowd, while BBC Sport pundit Jonathan Davies said it was "pathetic". During their numerical advantage, Australia scored one of their four tries when Adam Ashley-Cooper dived over in the left corner for one of his hat-trick. "I don't think there was no intention not to make a tackle," said Hourcade, 57. "There was a hit impact with the other player and he couldn't quite close his arms around the other player. "But they did the analysis and came to their conclusion and we have to respect their decision." Australia had beaten England, Wales and Scotland on their way to the last four, but were forced into making more tackles against Argentina than against any of their previous opponents. And Cheika, who has transformed the Wallabies' form since taking over in October 2014, was delighted with his side's defensive display in the semi-final. "Argentina are a very strong attacking team. They tore Ireland apart last week in the quarter-finals, we had to work hard to stop them scoring a try," said the former Leinster coach. "We can improve again and that's really important now. "Now we can think we've given ourselves a chance to play in a final and we will work out how we will do it against a dynamic team." Argentina had impressed many with their sharp attacking play in the 43-20 win against Ireland, scoring four tries to take their tally to 26 in five matches - second only to the All Blacks' total. But, after gifting Australia their two opening tries inside the first 10 minutes, they were unable to breakdown the Wallabies. "The players were very committed, very engaged, they never gave up looking for that try," said Hourcade. "We feel a huge pain because we were very excited and emotional. But I feel very proud about these players and I think it hurts more for them to lose than it hurts me. "I can't remember if I was crying or not but I was feeling for them because they gave everything. "I really congratulate them because they left their lives out there." Australia number eight David Pocock has been instrumental in his team's route to the final, with his quality at the breakdown helping provide momentum to the Wallabies at key moments. The 27-year-old, usually an open-side flanker, won four turnovers against Argentina, taking his total number for the tournament to 20. He has formed an effective partnership with back-rower Michael Hooper, who has hailed Pocock's impact. "You've got to want to put your head in there to get the result. Pocock puts his head into some places that are pretty dangerous and gets the ball out," said Hooper. "Not only does he win penalties, he gets a clean steal and that can change the momentum of the game really well."